Puddles of Myself: Puddles of My Mad Men: "Far Away Places"
As always, I am posting the link to my weekly Montreal Review recap of Mad Men. 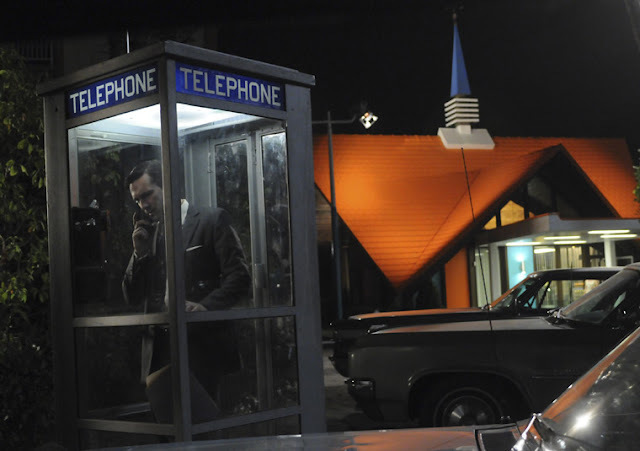 This week's episode "Far Away Places" was a complex, but very rewarding episode in the Mad Men series. Each one of the three storylines felt very much like a contained short story. Now, an episode of Mad Men will very often feel like a short story in the realism tradition, but each section of "Far Away Places"had elements that felt strongly of short fiction. Whether it was the pacing, the silences or the profound moments in short periods of time, it all felt very familiar to an English major like myself. The acid trip scene (how good did "I Just Wasn't Made For These Times" sound in that episode?) was especially striking as all of the visual and aural touches that were used very accurately conveyed many aspects of the hallucinogenic experience—especially the anxiety of being faced with the truth of your relationships with others and your perception of yourself. And in the end, we had Bert Cooper exerting his influence and power for the first time in two seasons and knocking Don down a Peg or two like he used to back in 1962-1963. You can read my Montreal Review here.